Mantra Fit’s Open Gym Circuit concept to our new Severna Park studio, which offers you flexibility and a purposeful workout all in one! Drop in during open gym hours for a fresh #whiteboardworkout every day. Our high caliber personal trainers design a 30-min circuit that combines strength training with bursts of high intensity intervals that will rev up your metabolism and build muscular strength (aka your foutain of youth). When you arrive, a Mantra Fit coach will explain the workout, demo the moves and review proper form. Then you’ll hit the circuit at your own pace. Mantra Fit’s Bootcamp classes are team based, creating an atmosphere of camaraderie that will help you tackle high intensity cardio and strength workouts that engage body and mind. All fitness levels welcome! Everyone goes at their own pace, with modifications given to work around injuries, as well as options to AMP UP the intensity. No routine is the same, and each class uses a mix of weights, battle ropes, tires, kettlebells, bodyweight, cardio, grit and determination. In the warmer months, bootcamp is led outside at both our locations: Severna Park & Nabbs Creek. Our top of the line Stages cycles will take you for the RIDE of your life. Experience our new music thumping, heart pumping, sweat pouring cycling class that will transport you in body and spirit. A one hour full body workout that fuses the best elements of ballet, pilates, sports conditioning and stretching resulting in a low impact but high intensity regimen. This routine includes intervals of strength training followed immediately by deep recovery stretching to sculpt the whole body. Build strength and define muscles in our resistance training class that employs kettlebells, dumbbells, medicine balls and body weight to create strong bodies and minds. Low impact, yet high intensity. Experience the heart pumping, team building, strength busting workout that is battle ropes. You will push yourself to the max and leave nothing behind in this interval class. It’s not to be missed! Maximize bodyweight resistance in this suspension training group session to build muscle strength, core stability and balance, while boosting your metabolic conditioning. Learn to fly and take your floor practice to new heights! Drop your fears and explore a sense of freedom using a soft fabric hammock that supports up to 1000 pounds and suspends you into inversions just 2-3 inches off the ground. Your aerial hammock will move you through traditional poses and assist your body to take on more challenging poses without strain, force, or effort. You will be able to achieve proper alignment, deeper stretches, more release in the joints & muscle fibers, gain abdominal & upper body strength, and conquer inversions. We also offer kids programs for Aerial Yoga. Email askus@mantrafit.com to learn when our next program is happening! Schedule a Private Aerial Yoga Class! Gather a group of friends and enjoy a private aerial yoga class! Cost is $175 for an hour long class for up to 10 students. Email askus@mantrafit.com to schedule your private aerial yoga class. Our multi level yoga classes mix strength, balance and stretch. You’ll start by focusing on breath and connection of breath to movement, then transition into a powerful vinyasa flow, set to upbeat music and mindful motivation. Every Thurs evening, join us for Community Yoga at Nabbs Creek. The same high caliber instruction at a fraction of the price. View our Community Yoga Schedule here! We also offer teen yoga in Severna Park. Learn more here. Transform your core and balance on boards that mimic the sensation of floating on water. The instability of the boards keeps your body and mind engaged as your led through cardio and strength intervals. Shake up your workout with Surfset! We love working with kids from aerial yoga to mat yoga to strength training, we offer a wide range of progams to help your child move mindfully and athletically. Tap the program titles below to learn more! Read below to understand our studio policies. 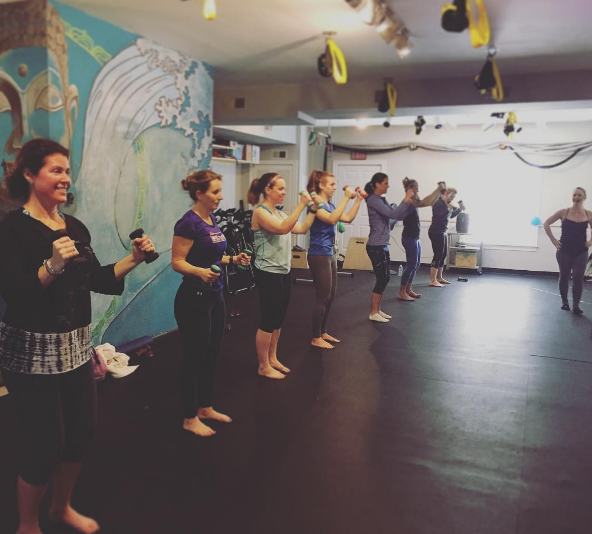 Studio membership applies to all land classes at our Severna Park studio. Studio packages do not include stand up paddle classes. Click the image below to purchase a studio class package. All classes must be signed up in advance. Clients may sign up for classes two weeks in advance of the class date. One of the reasons our clients love our studio is the community of small group classes where your fitness coach can give you personalized modifications and correct form as needed. Since space is limited, class sign up must be done in advance so we can ensure there’s enough space and equipment for everyone. All clients must sign and submit a waiver before participating in a Mantra Fit program or class. Please click the button to access our waiver. You may print and turn in the signed waiver at the start of your scheduled class/program. Our clients love registering for Mantra Fit classes through the Mind Body Connect app, which is free for smart phones. You can also sign up for classes online HERE. When purchasing a class, camp or special workshop with Mantra Fit, your purchase is final. Refunds will not be issued unless Mantra Fit initiates the cancellation due to weather or other circumstances. However, if you must cancel, your Mantra Fit class account will be credited the class to reschedule to another date. If it's a one-time class/camp/special workshop, your Mantra Fit class account will be credited the cash equivalent (minus any materials cost), which allows you to apply the balance to another program we offer. Your balance credit will expire after one year if it's not used. If you're a monthly member or class pass holder, please cancel class 24 hours prior to start time. If you're under the 24 hour window, the class will be deducted off your pass. A $15 no show fee will be charged to your account if class is not cancelled within 24 hours of the start time. We understand that life can get messy. If you planned on attending class, but can't make it happen, send us an email. If we can fill your spot from the wait list, we’ll waive the no show fee. Our email is askus@mantrafit.com. If you’re moved into a class from the wait list, you’ll receive a text or email notification. Send us a reply ASAP to confirm your spot or let us know you can’t make it so we can keep moving down the wait list. Important! Add automatedemail@mindbodyonline.com and askus@mantrafit.com to your Primary folder in Gmail or address book to avoid your waitlist notifications going to your junk folder. We are open during Open Gym and class times. If you’d like to schedule a tour, email is at askus@mantrafit.com or call 410-777-9255. We encourage all our members to join our Get Mantra Fit Facebook Group, which is where we post the latest and greatest news about classes and special events.